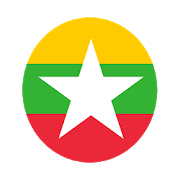 The Myanmar Money Rate App is showing real time Currency Exchanges rates of Myanmar Currency(Kyats) from Central Bank of Myanmar in A to Z format. User can also get any previous currencies rates from 01/01/2013 to current day. 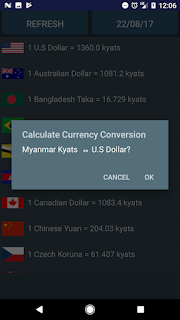 Moreover, users can also calculate currency version between Myanmar Kyat and any foreign currency from following lists in Currency Converting Calculator. To get the latest Currency Rate, please press Refresh Button. To selected Date, Please press the Date Button(for example 5/2/2014) and it will take user to calendar. And then selected the date in calendar. 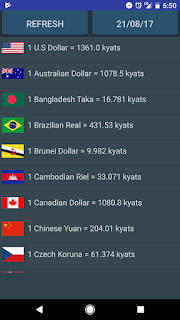 To calculate currency conversion, press currency you want to calculate in the currency list. When the dialog pop up, please press yes to continue currency conversion calculator. Thank you for using this app and I will be regularly update to add more feature.